Moanalua's Sarah Robinson allowed only four hits last night in a 4-0 win over second-seeded Kailua. Pitcher Sarah Robinson claimed she didn't have a dominating performance yesterday afternoon. Seeds: 1. Kamehameha. 2. Kailua. 3. Baldwin. 4. Hilo. 11: Hilo vs. Kamehameha, 10 a.m.
13: Moanalua vs. Mililani, 6 p.m.
14: Kapolei vs. Pearl City, 8 p.m.
16: Winners of Games 12 & 11, 2 p.m.
17: Losers of Games 13 & 14, 4 p.m.
18: Winners of Games 13 & 14, 8 p.m. But the sophomore's four-hit, seven-strikeout performance was enough for Moanalua to upset perennial power Kailua 4-0 on a day that saw all four seeded teams fall in the quarterfinals of the Data House State Softball Championships Division I tournament at Rainbow Wahine Softball Stadium. "I knew Kailua is a beatable team since we beat them first time around," Robinson said. "I wasn't overdominating Kailua because Kailua is such a good hitting team, so I relied on my defense and they came through. "We've never been here before," Robinson said of her team reaching today's semifinals. "I'm so psyched we made it this far." Robinson and Kailua pitcher Krista Dumandan held the bats in check for most of the game. Dumandan held Moanalua hitless until the bottom of the fifth. Shelby Nakachi led off with a double to center field and was moved to third when Noelle Young beat out a bunt to first base. Two outs later, Le'a Tamura drilled a 3-2 pitch to left field that went off the glove of Jarrish Mauhili-Kaneakua at the foul line, scoring two runners. Moanalua added two more runs in the sixth, when Ashley Hopfe replaced Dumandan in the pitching circle. Jamie Ronolo hit a bases-loaded, two-run single to center field. That four-run lead was all Robinson needed to close out the Surfriders in the seventh. She struck out all three batters she faced, including top hitter Shyenne Hussey. "She's a great hitter so that's why we walked her the previous times," Robinson said. "But we were up four runs so I wanted to go at her." 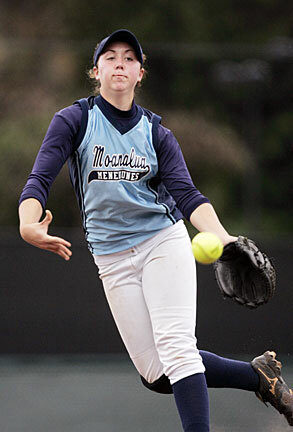 Robinson worked on her pitching with older sister Kate, a former standout at Kamehameha, over the winter break. Sarah worked on getting a faster pitch, risers and location pitches. "She was determined," Kailua coach Bernard Victor said of Robinson's performance. "We were just trying to hit the ball and not trying to hit with feeling. We were overswinging. The more we overswinged, the worse we were getting." Kailua threatened in the top of the fifth and sixth innings, but Moanalua's defense bailed out the Menehunes. Nakachi made two tough catches in foul territory from her spot behind the plate and Glennis Kanae-Rodrigues caught a fly ball in left field with two Surfriders on base. "All season long, we had that kind of defensive play," Moanalua coach Mitch Matsumoto said. "I always thought we were one of the best defensive teams in the state. "We don't hit that good, but defensively, we play real good." Krista Dumandan, Ashley Hopfe (6) and Brittany Tokunaga. Sarah Robinson and Shelby Nakachi. W--Robinson. L--Dumandan. Leading hitters--Kail: Daneen Williams 2-3; Alisha Vegas 2b; Hopfe 2b. Moan: Britni Ronolo 2 RBIs; Le'a Tamura 2 RBIs, 2b. The Chargers capped the night of upsets with a victory over the Warriors in the late game. Marina Gusman-Brown hit a solo home run for Pearl City (14-3) and Corrie Nishikida held off the Warriors (13-2) from the pitching circle. The Warriors tried to rally in the top of the seventh, but could only get Dara Pagaduan to score. Pearl City completed the upset when Jasmine Knight grounded back to Nishikida, who threw to first base for the final out. For the second straight year, all four teams in the semifinals are from the OIA. Ku'uipo Esperas and Jennifer Alohikea. Corrie Nishikida and Noelle Hirahara. W--Nishikida. L--Esperas. Leading hitters--Kam: Shaleese Javilo 2b. PC: Shanna Vierra 2b; Kanani Numata 3b; Marina Gusman-Brown HR. Tajia Acierto struck out 13 hitters and walked just one as the Hurricanes upset the fourth-seeded Vikings in the quarterfinals. Ka'ili Smith hit a three-run homer and Jasmin Yoro had two hits for Kapolei, the state runner-up last year and the state champion two years ago. Alana Tsue had two hits to lead the Vikings. Tajia Acierto and Ashlyn Ashby. Alana Tsue, Aisha Sueda (7) and Daysha Whitney. W--Acierto. L--Tsue. Leading hitters--Kapo: Ka'ili Smith 3-3, 3-run HR; Jasmin Yoro, 2-3. Hilo: Tsue 2-3. Mililani 3, Baldwin 2, 11 inn. Casey Sugihara drove in the game-winning run in the bottom of the 11th inning as the Trojans outlasted the Bears. Baldwin broke an 1-all tie in the top of the 11th when Sanoe Kekahuna scored from third base on a wild pitch that bounced off home plate and over the catcher's head. Mililani rallied in the bottom half of the inning, loading the bases with no outs. Chasity Senas scored to tie the game at 2 on a double play, setting up Sugihara's grounder that went past the Baldwin second baseman and scoring Celina Garces. Mililani led 1-0 after the first on Makani Duhaylonsod's RBI double. Baldwin tied it in the seventh on Kekahuna's home run. Mililani almost won in the bottom of the eighth, but Kimberley Goo's hit was caught right before it cleared the top of the center-field fence by June Ann Lusk. Nicole Alconcel and Sanoe Kekahuna. Makani Duhaylonsod and Skye Virtudes. W-- Duhaylonsod. L-- Alconcel. Leading hitters--Bald: Kekahuna 3-4, HR. Mil: Duhaylonsod 2-4, 2b, RBI; Celina Garces 2-5; Jaimee Aiwohi 2-5. Brittney Akana, Sasha Koki (5) and Ashley Smith. Kirsty Imai and Dayna Wong. W--Akana. L--Imai. Leading hitters--StF: Smith 3-4, 2 RBIs; Koki 2-4; Shannon Lum 2-3; Jandee Taira 2-4; Kelci Watson 2-3, 2 runs. Waik: Imai 2-3, 2b; Wong 2b. Tiana Vierra, Alexandria Smith (4) and Ashley Phillips. Breanne Patton and Anita Manuma. W--Patton. L--Vierra. Leading hitters--Lei: Vierra, 2-3, HR, 2 runs, RBI. Cam: Manuma, 2-3, RBI; Kaiulani Clark, 2-3; Sam Palipti, 2 RBIs; Leinna Kalua, 2 RBIs.